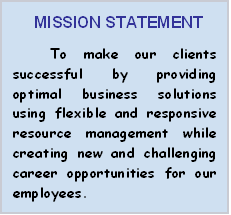 Solutions Delivery, Inc. (SDI) provides core business management solutions, such as Enterprise Resource Planning (ERP), Enterprise Application Integration (EAI), eBusiness strategy, planning and implementation and Enterprise Management. 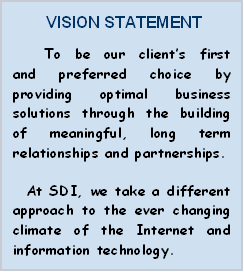 Founded in 2000, SDI has excelled in strategic business alignment, optimization and hands-on technical IT management. We offer an end-to-end approach to solutions delivery and provide a broad spectrum of services that include strategic business assessment, enterprise security assessment, feasibility studies, strategic and tactical planning, software evaluation, solution design, implementation, and ongoing support. SDI specializes in designing and delivering leading-edge technology solutions and services that are customized to provide reliable, flexible and scalable capabilities. These solutions interact with a multitude of open systems applications and hardware platforms - with a solid path to new technology. When properly planned and implemented, they provide significant cost savings across a number of processes and can be used as building blocks that support future business requirements. Staying on top of technology and its evolving direction coupled with a thorough understanding of our customer's goals and objectives is what enables SDI to recommend, design and deliver the right solution that helps our customers to achieve their goals. © Copyright 2000 - 20012 Solutions Delivery Inc. All Rights Reserved.